There I was, April 26, 2013 at 12:50pm I tweeted about sack lunches and drawing on paper bags. 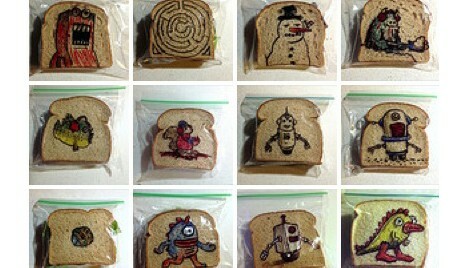 I think someone overheard me thinking in my head, because now there is another artist out there doing the same–only illustrating on sandwiches instead of the bags. I saw this on Core77, so take a peek and also check out David’s flickr site as well!